Cadmium Test Tubes with Concentration Color Chart - Order Now for Only $29.99! We're happy to offer our user-friendly Cadmium test tubes, including our specialty Cadmium indicator and corresponding concentration color chart. Our easy-to-follow, highly sensitive and accurate detection method will tell you how much hazardous Cadmium is in your drinking water or any other water solution you want to test. It's also a great science fair project idea. Cadmium accumulates in our bodies and throughout the environment. It is industrially used in pigments, as a coating for steel and copper, as an additive in plastics, in batteries and in solar panels. Exposure to Cadmium can cause sever respiratory, liver and kidney problems, which may be irreversible and fatal. Skeletal symptoms may include bone softening and loss of mineral density resulting in increased risk of fractures. 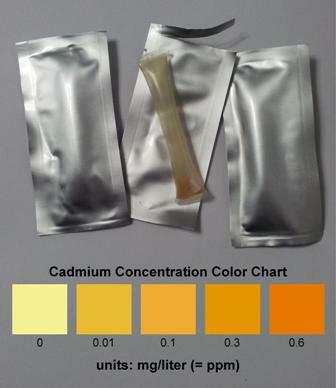 Cadmium testing is made easy by simply filling Home-Health-Chemistry's test tubes in a water-based solution and comparing the color change to the provided reference card. Four simple step is all it takes to carry out this high-quality test as shown below. The test tubes contain the exact amount of indicator required for easy and safe handling. You will receive 3 Cadmium test strips and an instructional card describing how to carry out the screening procedure, with a concentration color chart ranging from 0 to 0.6 mg/liter (0 - 0.6 ppm). You'll be able to check drinking water as well as solid samples by mixing or dissolving them into water.